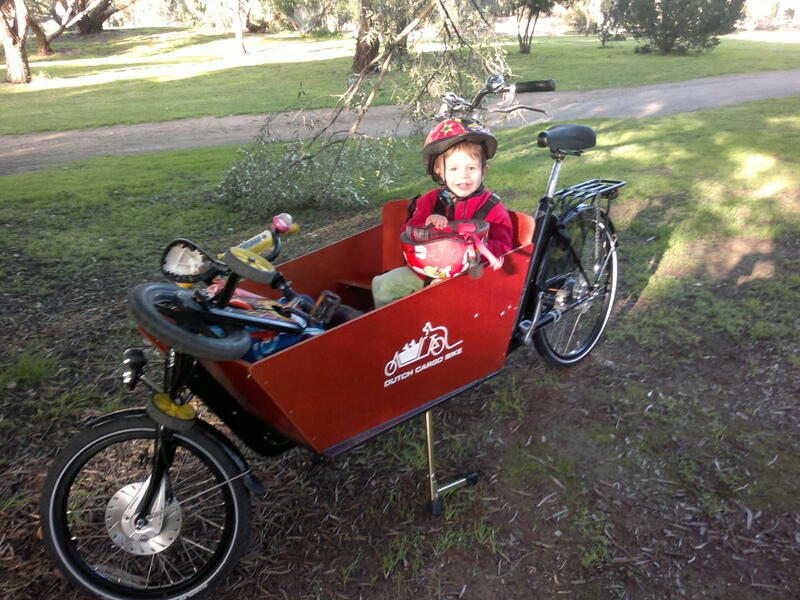 Accounts of an Adelaide Bakfiets Rider: So why did we get a bakfiets? We bought a bakfiets a few days ago. You don't see many in Adelaide, despite our having a fairly flat city, that is reasonably cycle friendly, and there seems to be very little information about the practicalities of using a bakfiets in Adelaide (or Australia for that matter). So I thought I would document some of our adventures as we go along to help fill this void. Also called cargo bikes, bakfiets are quite common in the Netherlands and Denmark and some other areas in Europe. The category covers a variety of bikes, from long-tails like the xtracycle, classic butcher/baker/milkman bikes with sturdy racks front and back, like the WorkCycles FR8, trikes like the Nihola Family or the classic heavy-duty Dutch cargo trikes, still being made in Holland after more than 100 years, as well as the middle-sized cargo bikes with mid-mounted passenger box that are common for lugging kids and shopping on a variety of errands, such as the bakfiets.nl cargo long (having a bakfiets manufacturer called bakfiets, does cause some confusion). Bakfiets is the Dutch name for "box/tray bike". The "bak" in bakfiets is the same base word that gives us "baker", someone who works with goodies in ovens on trays. The "fiets" part basically means "bicycle" and has a rather curious origin. Just to confuse us native English speakers, "fiets" is the singular, "fietsen" being the plural, with "bakfiet" not being a real word, although you will hear it from time to time. So why did we get one? Our two kids are now about 4.5 and 21 months, and we began thinking about next year and how to get Miss 4.5 to school and Master 1.8 to school and childcare in a reasonably efficient and sane manner. Driving Miss to school is out of the question because of the school's proximity to a particularly congested area near the intersection of the Noarlunga rail line with Diagonal Road near Marion shopping centre. Also, while we live only about 2km from the school, the shortest car route is more like 4km due to various traffic obstacles. In contrast, there is a quite decent bike track along the Noarlunga line that goes almost directly from our house to the school. So cycling has the potential to be substantially faster than driving, as well as much more pleasant experience. But we needed an all-weather solution that would keep the kids dry and happy. Also, Sunday afternoons my wife usually has the car when she catches up with some friends. I really wanted a transport option that would allow me to go places and do things with the kids during those times. In the past I have used a bike trailer to cart the kids around. However, they are just too big to fit in there any longer without achieving the same effect as putting a several rabid ferrets in a shoe box. Things will only be worse next year when they will be Miss 5.3 and Master 2.4. So we needed a new solution. I already knew that the Danish and Dutch had solutions to this problem, so a bit of hunting around and talking to our Danish friends enabled me to find out a about a variety of bakfietsen, with the feeling that it was just a matter of finding the most appropriate type. The more I looked into it, the more I discovered that many people who had a bakfiets found it really contributed to their lifestyle, especially the type where the kid seats are in front. Kids seem to love riding in them much more than in a trailer, which isn't too surprising since it is effectively a long-range wheel-barrow ride. It also seems to foster a very relaxed and social riding style. Being able to talk with your kids, and even just listen to them yabbering away in front of you is lovely. The simple practicality of a family transport bike was also appealing. For example, taking the kids to the beach on a regular bike+trailer is a pain. Issues such as locking it up, keeping it out of the sand/salt, and keeping the kids happy in the trailer, and fitting in the gear all add up to make it easier to just drive. In contrast, just being able to chuck them and their stuff into a big bakfiets, and riding it directly to the beach, stoping it on its own stable stand, and using the built-in lock, as well as being able to talk to the kids about what they are going to do when they get there makes for a much more appealing excursion. This enabling aspect of owning a bakfiets was particularly appealing, and I have to say that it seems to be panning out already. But more about that in future posts. In the end we chose a bakfiets.nl cargo long (without electric assist), as it seemed to meet our needs (fit two kids, full weather cover, and room for their bags and my work gear, long-lasting and low-maintenance). I was particularly encouraged that these bikes are quite popular among Dutch mums who have essentially the same requirements. They are not cheap (about $3,100), but they are built very solidly, and should last for many years. It's hard to find things built to last, but the bakfiets from bakfiets.nl seem to be. Caleb in our bakfiets with his big sister's bike in the front of the box. The big thing in the front wheel is the heat-sink for the Shimano roller (drum) brake --- we didn't buy an electric assist model. Originally, we hadn't intended to get one just yet, but Dutch Cargo Bike Australia had some specials on, and it seemed worth our while to buy the bakfiets a few months earlier. The deal eventually consisted of a full-price bike, but with the sturdy weather shield thrown in, a saving of about 10% overall. Alternatively, I could have got one of their ex-demo bikes for 10% off, which would have worked out fractionally cheaper, but with a Shimano 7-speed hub instead of the 8-speed one in ours. The main benefit is the significant greater range of the 8 compared with the 7 (306% versus 244%). I am already glad to have the 8-speed Nexus hub, because I work at the top of Flinders University, about 140m higher altitude than my house, and with some quite steep grades along the way --- not really that naturally suited to a heavy bakfiets (ours weighs about 34kg). Ideally I would probably like one lower gear, but I am not willing to give up the top-end yet. With the 7's narrower range I don't think it would be possible to get the bike and all my stuff up there under my own steam, without sacrificing the ability to pedal faster than about 20km/hour. If I was saner, I would probably have got the electric assist, but I fortunately have good leg strength, and am keen to get my riding strength and stamina back up again, so while it is hard work, it doesn't worry me. Also, at about $1,200, economic rationality suggested trying without first.